Jaakko Stenros (M.Soc.Sc.) works as a game researcher and a doctoral candidate at Game Research Lab (University of Tampere). 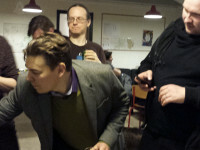 He is an author of Pervasive Games: Theory and Design (2009), as well as an editor of three books on role-playing games, Nordic Larp (2010), Playground Worlds (2008) and Beyond Role and Play (2004). He lives in Helsinki, Finland.